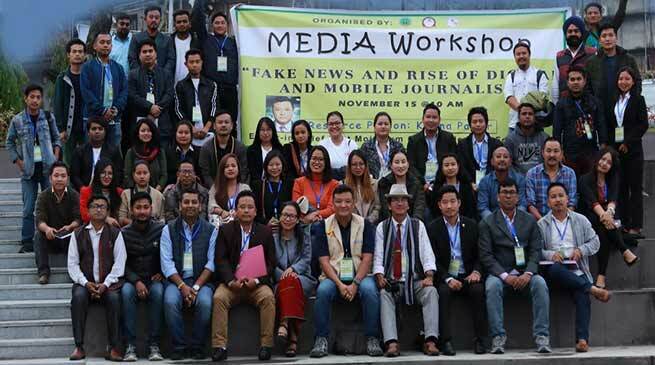 A media workshop on “Fake News and Rise of Digital and Mobile Journalism” held at the Dorjee Khandu Convention Centre. “The journalists of today’s era have to be the gatekeepers of the society; gatekeepers to protect it from the influence of fake and incorrect news,” said East Mojo editor in-chief, Karma Paljor on Thursday. Paljor who was addressing a media workshop on the theme “Fake News and Rise of Digital and Mobile Journalism” here at the Dorjee Khandu Convention Centre said that, Fake News has not only become a primary concern for the major countries of the world but also a big predicament for tech powerhouses like Google and Facebook. “As journalists we need to flag fake news and stand against it in a united way. Fake news stories are more tempting for the normal public to share so we have to play the gatekeeping role that the legacy media houses once played,” said Paljor who was the resource person for the workshop. Gatekeeping as a theory is the news selection and extraction of news, which then gets passed through a series of gates (the journalists), gets transformed and ends up in the news. Acknowledging that the biggest factor behind the success of fake news stories is their high level of social engagement, Paljor said that one of the main concerns of fake news is that they can polarize the society, especially during political events and elections. Citing example of the mob lynching that took place in Assam in the month on June this year where two youths lost their lives following the circulation of fake news in WhatsApp, Paljor said that journalists, as well as the normal public can easily identify a fake story by using mere common sense. “Identifying fake news is easy most of the times as all you need is a critical mindset. Check the credibility of the source from where the news has been published or shared; verify the names/designation of the people who have been quoted in the news,” said Paljor. Speaking on the topic ‘Rise of Digital and Mobile Journalism,’ Paljor, who himself is an award-winning journalist, informed that people, particularly the youths of today’s generation are spending more time on internet than ever before. It was informed that as per a survey conducted by Hootsuite, the average mobile internet user in India spends almost 70 per cent of the time on apps like Facebook and WhatsApp and music and entertainment apps and among that the time spent by the people of north east in Facebook is highest in the country at 83 per cent. Sharing the practices his media house uses to promote its stories, Paljor called upon the scribes to engage with the community when they file reports. “When you engage with the people, the people engage with you. The mobile social media penetration in India as of January 2018 is 75 per cent which means that we have a 7 hour window in which we can connect with the people,” he said. Paljor also called upon the media houses of the State to maintain a strong, but healthy competition amongst each other so that its influence reaches out to the masses in a positive way. Amar Sangno and Mukul Pathak, presidents of Arunachal Pradesh Union of Working Journalists (APUWJ) and Arunachal Electronic Media Association (AEMA) respectively also spoke on the occasion. Besides the journos of State, Mass Communication students from Rajiv Gandhi University, members of All Arunachal Pradesh Students’ Union and Galo Students’ Union and senior journalists Pradeep Kumar Behera, Taro Chatung and Utpal Boruah were also present on the occasion. The daylong media workshop was organized by the Arunachal Press Club, APUWJ and AEMA in a run up to the National Press Day Celebrations on November 16.